As Yellow Umbrella Events looks into another year of planning extraordinary events we are definitely noticing some big style trends in weddings (and even in some of our corporate events). And today we wanted to take a moment to share with you just 5 of our predictions for 2013 wedding trends. 1.) The Great Gatsby – This is probably my favorite so we’ll start here. I have always loved this book and I’m so excited that the new Gatsby movie is coming out in May. Since high school I have imagined myself living in the era of the speak easy. Really, what’s not to love?! With the gorgeous art deco buildings and design, inspired typography and ephemera, flapper dresses, and amazing hair pieces, you’re sure to find something that you can incorporate into your wedding. 2.) Gold – Gold, gold, everywhere gold! It’s all over the place like it’s suddenly been rediscovered. It is THE must have color for 2013 (even more so than Pantone’s pick, which we’ll discuss in a minute). It’s very versatile and goes with just about anything – it can be dressed up with deep rich colors or dressed down with naturals like cotton and wood slices. I am a huge fan of mixing different textures of gold pieces, like gold lame fabric with rustic gold metal candlesticks and sprayed gold branches with a hint of glitter! If you’re looking for an accent color for your 2013 wedding, look no further. You’ve found it. 3.) Emerald – While we’re on the subject of colors, let’s talk about Pantone’s color of the year, Emerald. Every year Pantone.com comes out with their color pick and the fashion industry follows suit, creating fashions around this color. And, as you might suspect, it quickly makes it way into the wedding industry. And it doesn’t hurt that it totally coordinates with the aforementioned gold! I think it will be interesting to see the many fun ways this color will be combined and used for weddings beyond the obvious of royal color combos. For some reason emeralds always make me think of Indian princesses and Elizabeth Taylor – yes, I know, two completely different things, but hey, I can’t help the word pictures that pop up in my mind! 4.) Natural Bohemian Elegance – To say that elegance is the overall theme of 2013 would be an understatement. But some chicks like their elegance with a major dose of natural elements. And this is what I’m dubbing Natural Bohemian Elegance. You know, hair down with natural flowing locks of gentle curls with non traditional hair pieces, non poofy dresses and saying I do in a wildflower field in the middle of your grandparents 100 acre ranch. This is not to be mistaken for country, because, nothing could be further from the case. This is flower child meets the glam of today! This is a trend that us Austinites totally embrace. 5.) The Outdoor Wedding – This trend has been around for a while and it’s here to stay. Though 20 years ago the majority or ceremonies were held in a church because it was considered “connected to God”, today the majority are held outside – and for the same reason. This generation feels more connected to God in the great outdoors. And I say Yay to that! I love being outdoors and an outdoor ceremony has all that good natural light that my photographer friends are always clamoring about. So there you have it – my top 5 wedding trends of 2013. I hope you will find some inspiration in them and maybe even use one or two for your own wedding. 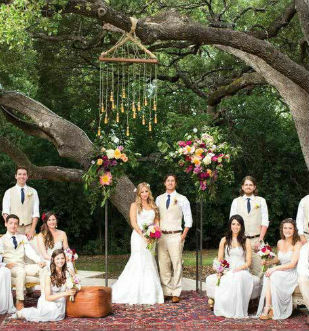 Are you planning on using any of these 5 wedding trends in your 2013 wedding? Let us know by leaving a comment below.